Understand what’s behind the stretch reflex, and what other factors might cause your legs to start shaking. Have your legs ever started shaking during a training session? You know, when you’re in a really good, deep hamstring stretch and your leg starts shaking seemingly uncontrollably? Maybe you’ve never really thought about it, or maybe you’ve always paused and wondered if you’re doing something wrong. Well, we did a little digging to help you understand what’s behind this phenomenon. There isn’t a ton of clear research or evidence in relation to shaking with flexibility, but most people agree that it tends to do with the muscles being forced to move or contract in larger than normal motions. There is one line of thought that as a muscle and tendon or ligament get stretched to the perceived end range of motion, the nervous system tends to put the brakes on due to threat detection. It could be possible that the shaking is a protective mechanism to help prevent tissue damage. There is another line of thought that because the body isn’t used to those ranges of motion, the nervous system can’t control the muscle well and starts to freak out a bit. Again, lots of theory but based on some solid neuroscience on muscle function. When your muscles start shaking, we recommend two options: either maintaining the current intensity (as long as it doesn’t cause any pain) or slightly decreasing the intensity (backing off a little bit). The goal is to challenge yourself but to prevent overtraining and unnecessary stress. Increase the intensity incrementally so you can build sustainable changes in your body (flexibility that’ll stick with you for the long run!). If you dial up the intensity too much you might put yourself at risk for injury and overuse. The most important thing to take into account is how your body is feeling while you stretch. Feel a sharp, sudden pain? It’s time to back off. Feeling uncomfortable but able to manage the sensations and relax your nervous system? Then you’re good. Just continue taking steps towards greater intensity slowly and with control. Be gentle and wise with your body! There are a few other causes of shaking that you might want to consider. Keep these in mind and try to identify if the shaking is part of a normal training process, or if you might need to adjust your schedule a little (and pass on that afternoon coffee before you hit the mat!). Have you ever had a cup of coffee on an empty stomach and felt a little shaky? 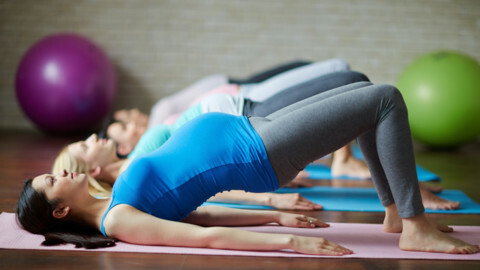 If you have too much caffeine from coffee, tea, chocolate or another source, it can leave you feeling a little woozy in your workout (especially when you get your hips above your head in a downward dog or another inverted pose!). If it’s not the stretch reflex that’s making you shake, it might be your caffeine consumption. Physical fatigue can also cause more than normal shakiness when you’re going for that hamstring stretch. Did you strength train or complete an endurance workout before your stretch? If you hit the squat rack or another challenging feat before starting your StretchIt session, it could be the culprit of your shaky legs. As long as you can maintain proper alignment and control, you can stretch safely even after a tough workout. 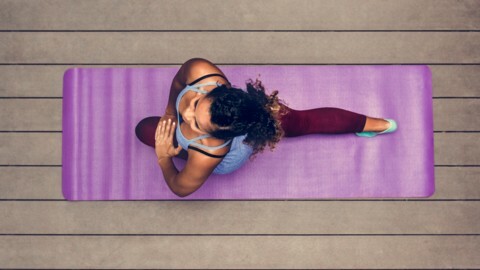 If you’re feeling like you’re “letting everything go,” it may be time to reschedule your stretching for another day when you’re not so tired and fatigued. Yet another reason to keep your water bottle by your side! Dehydration can cause all sorts of shaky, light-headed behavior. Remember to hydrate before you train (ideally far in advance, so you can be ready to jump in when the time is right). There are all sorts of other benefits to staying fueled with H20. Did you know it can lubricate your joints and regulate your body temperature? It also keeps your skin refreshed—so sip water and show off that glow! When you’ve completed a training session that left your legs shaking, be sure to take adequate recovery time. Your body is signaling to you that it’s putting in the hard work, so be kind to yourself. Take adequate recovery time to relax and renew. During recovery, your muscle fibers repair and rebuild to support greater strength and new ranges of motion. With plenty of rest, you’ll be ready for a new challenge the next time you workout. Happy stretching! We love a good hamstring stretch!